ContiTech has developed bushing for Volvo Construction Equipment (Volvo CE) for use in particularly challenging applications such as when loads are heavy and the terrain uneven. 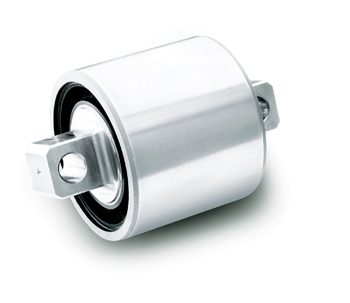 Mounted on the rear axle, it ensures optimum damping in articulated haulers of the full-suspension (FS) type. 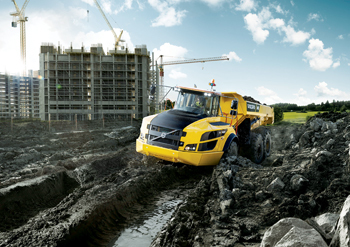 For several years now, Volvo CE has been using elastomer bushings in this type of construction vehicle as the connecting element between the hydraulic spring strut and axle. Volvo CE approached ContiTech Vibration Control in order to substantially reduce maintenance work on this component. ContiTech Vibration Control acted as an engineering partner and assisted Volvo CE in developing a bushing with a much longer life than the component used to date. “Our engineers faced a particular challenge in terms of the material,” reports Dr Stefan Narberhaus, head of industry development at ContiTech Vibration Control. “There should be minimal loss of shape to the material, even under heavy loads. But at the same time, the component should retain its rigidity and fit into the available space without changing the connecting parts. We found the right rubber compound to combine these properties.” The engineers also adapted the geometry of the bushing, thus optimising its durability. Meanwhile, ContiTech will be bringing numerous innovations to the 2015 Hannover Messe trade fair (April13-17), where it will have two stands this year. At the corporate stand in Hall 6 (Stand F18), it will be all about the process and materials expertise of the rubber and plastics specialist and its added-value partners. At Hall 25, Stand B18, the focus will be on products such as drive belts, hoses, hose lines and air spring systems. Highlights from the stand in Stand F18, which will bear the slogan “Engineering Next Level,” will include the SafeTrap scaffolding hatch; printed electronics, with which electric conductor paths can be printed cost-effectively; and a vehicle component made of plastic that opens up new performance classes. The SafeTrap scaffolding hatch has passed fall tests and is now being used for the first time by ContiTech’s development partner Altrad Plettac Assco, one of Germany’s leading one-stop suppliers of façade, modular, and mobile scaffolding systems. The self-closing, flexible scaffolding hatch offers maximum safety. Whereas conventional solutions are flexible only to a limited degree, SafeTrap is based on a combination of an aluminum profile and a vulcanised rubber layer with fabric reinforcement. Workers on scaffolding can open the hatch with their heads when climbing. This means that they do not have to put down tools, building materials, or other materials in order to open the hatch. The hatch then closes by itself or with a push from the worker’s foot. The products on display in Stand B18 will include drive belts, hoses, hose lines, and air spring systems from ContiTech. The company has broadened its range of eco-friendly drive belts. With the Conti Polyrope, ContiTech has made further developments to the successful flat belt technology that was introduced to the elevator industry in the late 1990s. The Conti Polyrope composite cord consists of steel cords embedded in a polyurethane coating. As a means of suspension for elevators, it offers numerous advantages over conventional steel cords.